We feel right at home at SeaWorld ... and it's not just the large amount of water for us to splash around in. 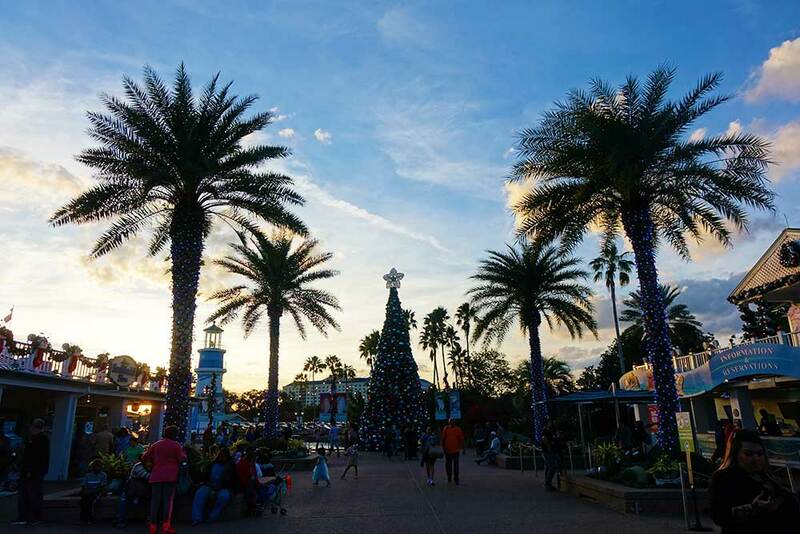 SeaWorld Orlando has a way of making every holiday come alive with the perfect amount of festivities to make you feel like you're at an amazing theme park and your hometown, all at once. 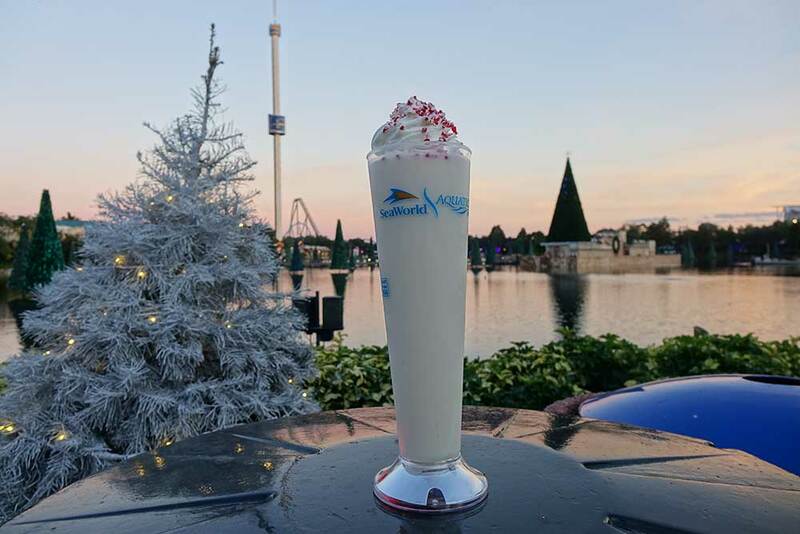 With decadent treats, impressive entertainment and millions of glittering lights, SeaWorld's Christmas Celebration is the perfect example of holidays done right. What more could a Frog Family ask for? We were lucky enough to hop in on the first day of the festivities this year. We were given the good fortune of mild temps and low crowds ... and wish the same for you! Here’s our lowdown on SeaWorld’s Christmas Celebration 2018, taking place on select nights Nov. 17 through Dec. 31. 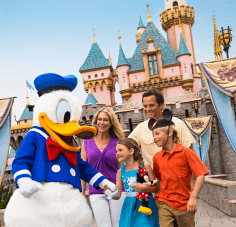 It's all included with regular SeaWorld park admission, so you should definitely hop to it! 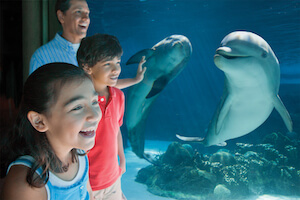 SeaWorld Orlando always blows us out of the water (so to speak!) when it comes to entertainment, and SeaWorld's Christmas Celebration is no exception. Taking place daily at the park, tons of seasonal-exclusive shows are taking place. Showtimes vary by day, so be sure to check out park hours before making your plans! If you’re a fan of the traditional Shamu show, you’re in for a real treat with Shamu Christmas Miracles. Leap adores the soundtrack of this exciting show. This nighttime holiday spectacular tells a tale of peace, friendship and love to remind the audience of the everyday miracles that surround us, especially in the heart of the holiday season. Multiple orca whales join together to perform an awe-inspiring routine inspired by the hope and joy we oftentimes overlook. Clyde and Seamore’s year-round shows have become a staple in our SeaWorld visits. We love the goofy humor that makes this show so fun and unique. Plus, the mischievous otters that always make an appearance are Lily’s favorite! 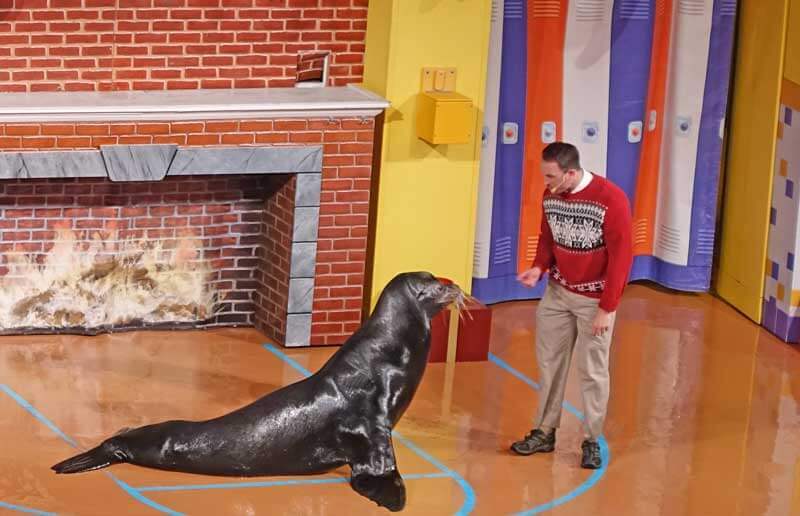 Sea Lion and Otter Stadium transforms into a home for the holidays, as sea lion pals Clyde and Seamore host the festivities. An elf and even a walrus join the party! Join Clyde and Seamore on Christmas shopping adventures and more as they await the arrival of Santa Claus. This show is full of the typical fun, amazing tricks you’ve come to expect from Clyde, Seamore and company. You’ll be singing “Walkin’ in a Water Wonderland …” while walking through SeaWorld’s immersive sea of holiday trees, which appear to be floating on water. Over 100 trees are lit up in holiday lights that sparkle to Christmas tunes. This fun display is visible throughout the evening and great to appreciate in passing between shows. 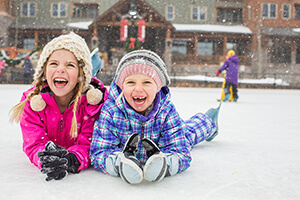 Nothing says “Christmas” like a little ice skating — and this show screams “Christmas” with a full-blown extravaganza on ice at Bayside Stadium. Figure skaters will wow you with choreography to classic Christmas tunes. 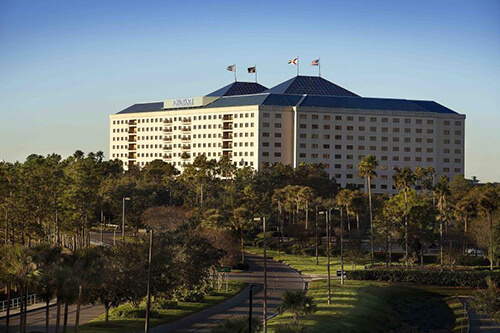 Enjoy the dazzling view of the Sea of Trees as professional skaters amaze you with their show-stopping moves. Our personal favorite was the rendition of The Christmas Waltz. Lily is a huge fan of Sesame Street, so Elmo’s Christmas Wish is a can’t-miss for our Frog Squad. This Christmas show hosts a slightly different ensemble than the Halloween special, which means Cookie Monster and Grover make an appearance alongside Elmo, Zoe and Rosita. The Sesame Street gang works together to help Elmo find his Christmas wish at Seaport Theater. 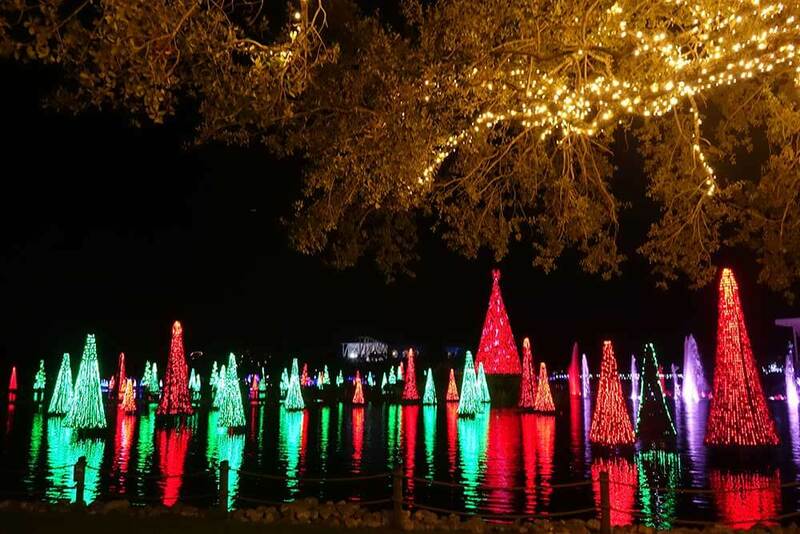 Be reminded of the reason for the season with O Wondrous Night at the SeaWorld Christmas Celebration 2018. 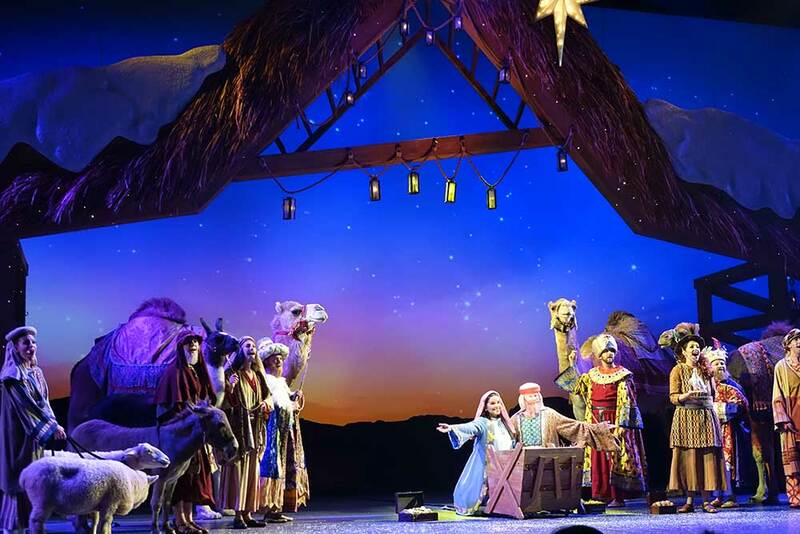 This live nativity show at Nautilus Theater brings the story of Christmas to life through the perspective of the animals that were there. The show features life-size puppets, special effects, live animals and over 30 carols to delight your entire frog squad. O Wondrous Night is a peaceful, joyous celebration that will wow your whole family. This Mama Frog was nearly brought to tears by this beautiful presentation! It has the perfect combination of humor and faith to touch the heart of each member of your Frog Squad. Don’t leap out early … the grand finale is a can’t-miss. Meeting nearby Wild Arctic this holiday season, you can share your wish list with the big man himself at SeaWorld’s Christmas Celebration 2018. 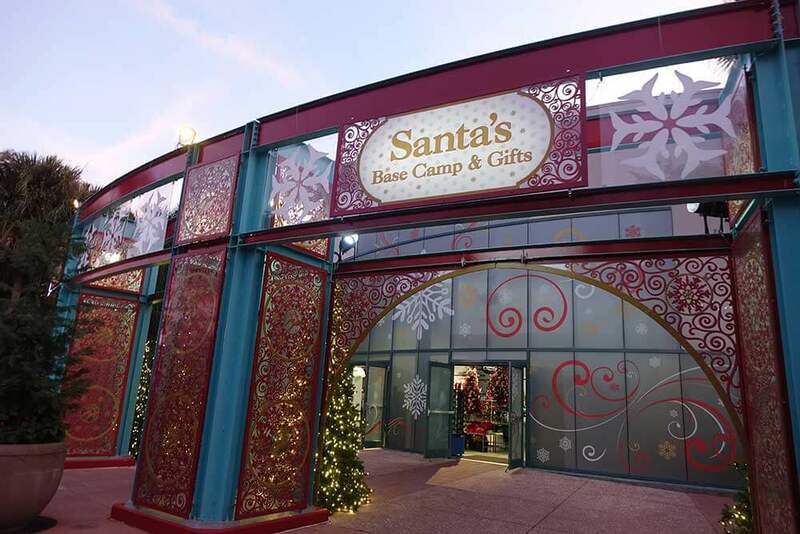 You'll find him at Santa's Base Camp & Gifts ... your one-stop shop for all things Christmas. 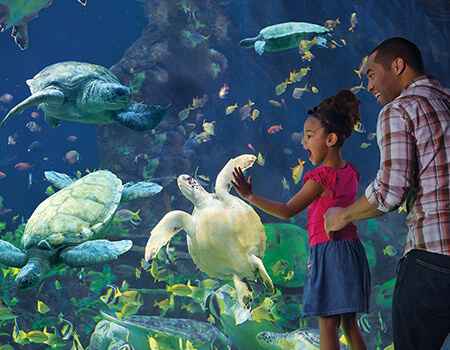 Check out fascinating animal encounters on your voyage to meet Santa Claus, as you only can at SeaWorld. We love this not-so-typical visit to Santa. If you’ve already met up with Santa elsewhere, there are plenty more holiday friends to hang out with. Be sure to explore Rudolph’s Christmastown to stroll through a life-size story book of the Rudolph’s classic tale. Along the way, you’ll find Rudolph, Clarice, Bumble and Yukon Cornelius of Rudolph the Red-Nosed Reindeer fame are here to play and take photos with you and your tadpoles. 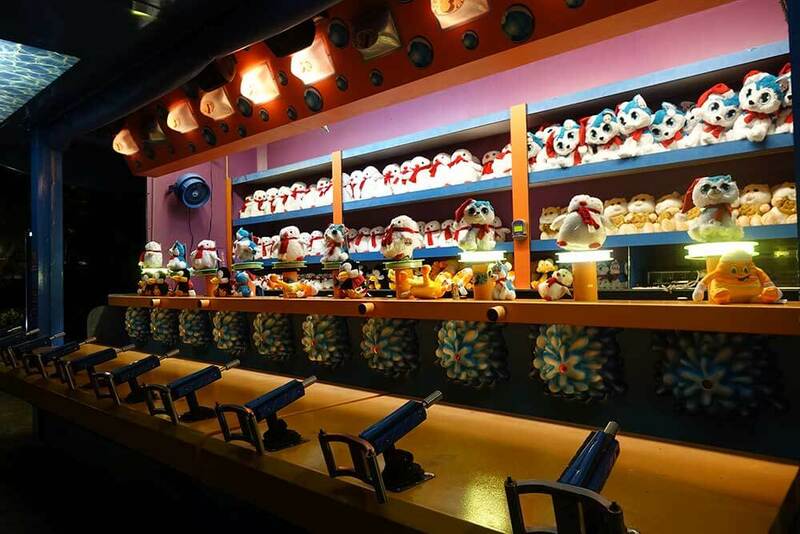 We highly recommend taking the time to meet these cute, fun, unique characters. 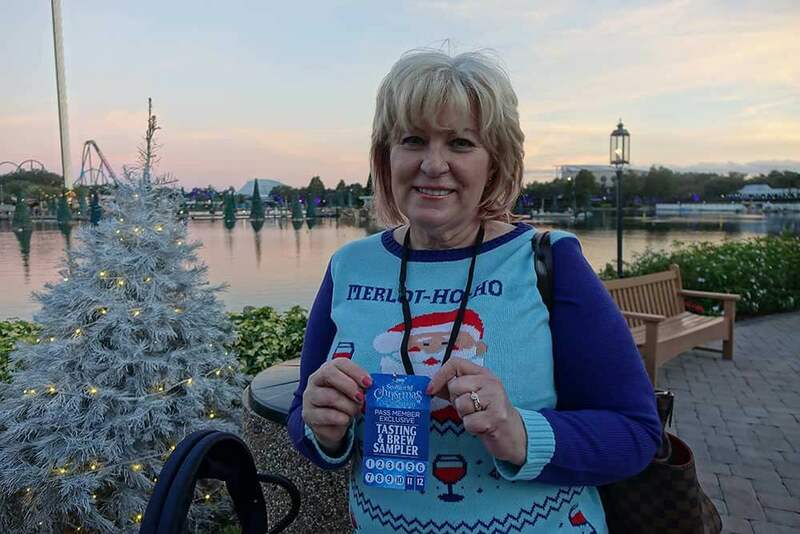 There is so much fun to be had at SeaWorld’s Christmas Celebration 2018 that it can be hard to find the time to relax. Be sure to spend a few minutes moseying through the Christmas Market along Bayside Pathway. The Gazebo Stage hosts musicians singing Christmas favorites, playful elves and the hilarious interactions of the Christmas Council. Find playful nutcrackers and living statues for fun photo-ops. 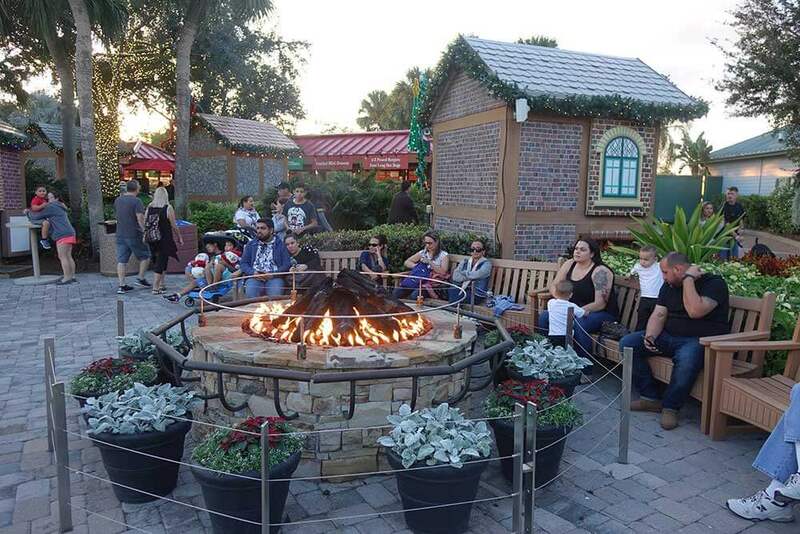 There’s even a glowing fire pit to enjoy (or at least pretend to, since the Florida weather keeps us pretty warm as it is). Tad especially enjoys the model train village, which is definitely worth checking out. Speaking of Rudolph, you can catch dinner with your favorite red-nosed reindeer as well. Make reservations for this family-style holiday feast full of traditional, savory fare and to share hugs and smiles with Rudolph. Don’t worry, there is plenty to enjoy outside of Rudolph’s feast. SeaWorld’s Christmas Celebration 2018 is overflowing with special holiday snacks and treats. There are plenty of seasonal dishes that are sure to have the whole family hoppin’ for more. We were obsessed with the cinnamon sugar doughnuts at the SeaWorld Spooktacular … so imagine our delight when we found a variety of stuffed doughnuts as part of the Christmas festivities. Another Frog Family Favorite was the waffle cone S’mores. (I’m a known sucker for S’mores in any form!) If you’re looking for a more savory snack, the short-rib mac and cheese was a crowd favorite among us. At both Shamu Christmas Miracles and Clyde and Seamore’s Countdown to Christmas, there are designated “splash zones” where you are sure to get wet. Keep an eye out for these and sit a couple rows back if you have no interest in getting soaked … or even sprinkled on. Enjoy the wait before shows! O Wondrous Night! hosts a guitar playing singer for holiday singalongs, Shamu Christmas Miracle presents an excellent saxophonist, Winter Wonderland on Ice has an impressive violinist and Clyde and Seamore’s Countdown to Christmas offers a fun, interactive mime. Of course, these are subject to change ... but keep an eye out during your visit! To keep little ones busy, invest in a Christmas Game Pass to get 5 games for $20. There are tons of adorable prizes, and this was perfect for Tad and Lily to share! SeaWorld’s Christmas exclusives don’t take place every day. Check our Orlando Crowd Calendar for park hours and when to visit SeaWorld’s Christmas Celebration 2018. We recommend going on a night the park is open later for maximum time to enjoy the fun. Elmo’s Christmas Wish is the only show that takes place throughout the day on select days, while the other Christmas exclusives have only evening showings. Be sure to catch an earlier show to clear more time for Christmas activities later on! Plot out your night appropriately. 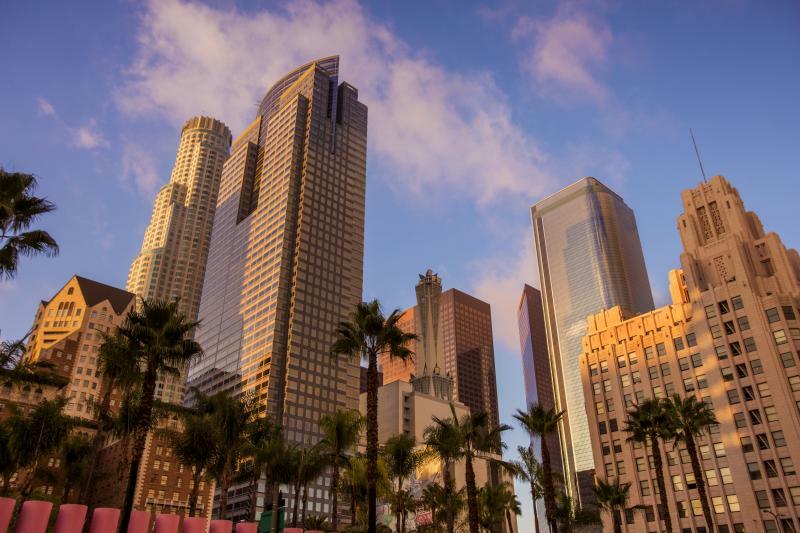 Know that each show lasts approximately 20 minutes, and allow yourself plenty of time to get to your next destination. Some shows are located across the park from one another. Tasting and Brew Samplers are a great way to sip and savor SeaWorld’s best treats without breaking the bank. The “Red” Sampler ($25) covers any combination of five Food & Brew Samples; the “Gold Sampler ($40) covers 10. We recommend going gold and sharing sweets and treats with the whole family. For a unique Christmas card photo, have your photo taken inside an actual snow globe! This is a fun photo-op that we’ve never seen anywhere else. 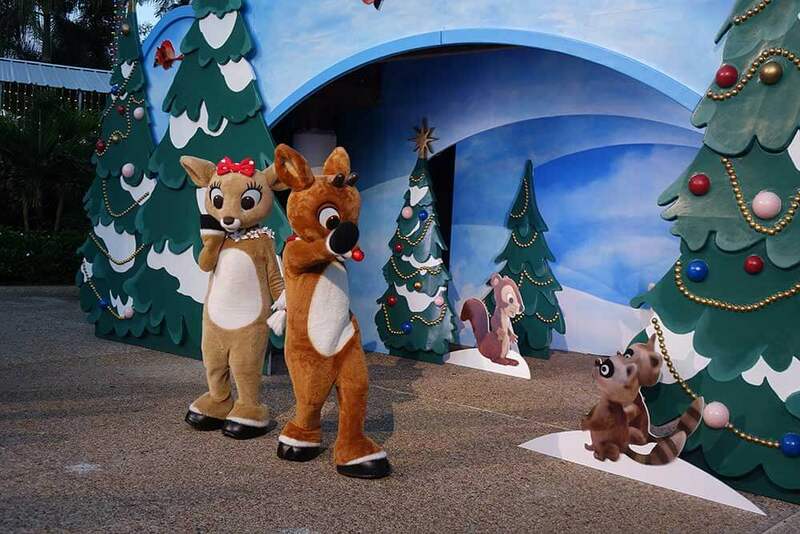 While shown together on SeaWorld’s site, the characters in Rudolph’s Christmas town meet separately. Bumble and Yukon Cornelius meet individually, while Clarice and Rudolph are together. Lines are short and sweet at the end of the night! Check out decorations throughout the park ... we particularly LOVED the modern, sleek decor outside of Infinity Falls! 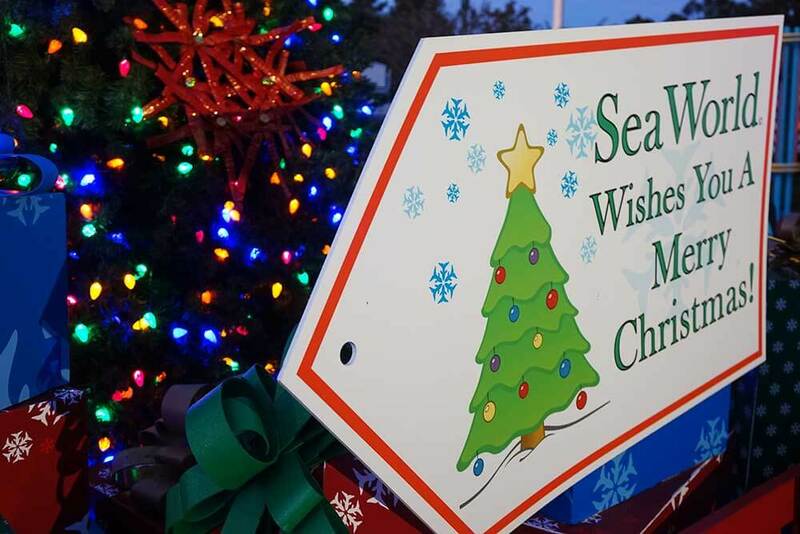 SeaWorld’s Christmas Celebration is the perfect way to kick off (or close off) your holiday season. We love the classic tales and tunes being presented through every bit of the festivities. 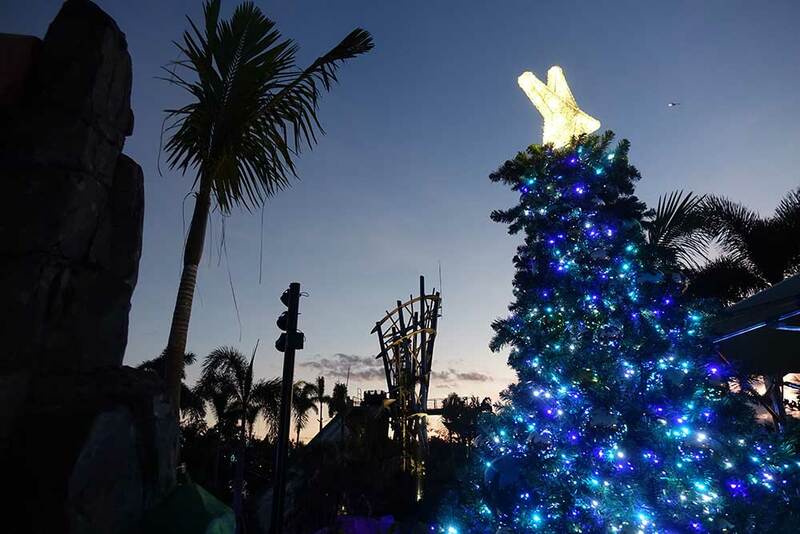 SeaWorld is the perfect Orlando destination for a more traditional take on Christmas. What’s your favorite part? Tell us in the comments. I agree! Sea World is so amazing for the hollidays. We have had Disney annual passes for about 11 years straight. The past 5 or 6 years we buy sea world passes too just for Halloween and Christmas. They blow Disney out of the park for the holidays. Sea World is the BEST Park by FAR for holiday decorations and activities. We go about 7 times between Halloween and new year's then go back to Disney when all the crowds clear out. SeaWorld has really outdone themselves. Their Christmas decorations are outstanding and all theirs shows are wonderful. So much for so little. We've gone there at least 5 times this month. Annual pass definitely worth it. I know the Christmas shows start at 5 pm and you can get reserved seating for $30 but are there still regular “daytime” shows as well that are different? I was considering getting the quick queue ticket upgrade as well. Thanks in advance! Yes, there are tons of shows taking place throughout the day as well. We recommend checking out the showtimes for the day of your visit. Do Rudolph and the gang meet all day every day? I know some shows are only certain days and the lights will of course just be at night, but could we meet them early to kind of get that part out of the way to leave time for all the night stuff? Love your blog! We just came back from Busch Gardens in Virginia, and we are trying to go to SeaWorld the day before our cruise. I was curious if you knew if the rides were opened during the Christmas event. Thanks! Weather permitting, all rides are operating as normal during the event! We got to walk on some of our favorite coasters! Wondering if the X-mas show Itinerary 1 package includes all of the shows listed for the $30 price or you pick one of the shows listed for the $30 price (Show Times for Itinerary 1 are: Clyde and Seamore's Countdown to Christmas 5:00, Winter Wonderland on Ice 6:15pm, O Wondrous Night 7:15, Shamu Christmas Miracles 8:30)? Thanks for the info! The $30 "Itinerary 1" upgrade package found on SeaWorld Orlando's site includes reserved seating for all of the shows listed as those given times, not just one. How awesome?! Is the Polar Express train ride back for the Christmas Celebration 2018? It is not, but there is plenty more fun to be had! SeaWorld Orlando's Christmas Celebration starts on November 17 and Shamu's Christmas Miracles will be returning! I'm curious about why your crowd calendar recommends Saturday and Sundays during the Christmas holidays? I would have thought that they crowds would be slightly lower on week days? We recommend weekends during the holidays at SeaWorld since that's when a majority of their Christmas Celebration takes place! Hello! We are visiting FL in December this year and am hoping to come on one of the Christmas Celebration nights. In the past was this only a weekend thing? Well be going to a few other theme parks but would love to see this! Thank you for your GREAT BLOGS!! The Christmas Celebration is so fun and so amazing, you'll really enjoy! 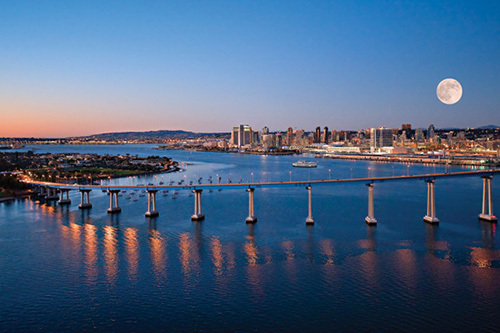 The event isn't exclusive to weekends, but does only take place select nights, so be sure to plan ahead! We'll update this post when more details are announced for this year. Does Sea World Orlando have plans to bring back Polarexpress experience in 2018? They didn't have the Polar Express ride last year, so I fear they may have done away with it; it seems Rudolph and co. have become the new featured IP for the event. They still have Santa's Workshop, just with the normal Wild Arctic ride instead of the Polar Express overlay. I guess it fits thematically, since you're visiting the north pole, though it's still sad because the Polar Express theming was honestly more elaborate (and also not 25 years old). We haven't heard one way or another, but we'll keep you posted! Hello! We are going on Sunday 11th Dec and have purchased the reserved seating package. On the tickets it requests you arrive 15 minutes prior to each show but in your article above you mention queing up approximately 45 minutes in some instances (i am assuming/hoping this is without priority seating)? I am hoping they only allocate/sell a number of reserved tickets and therefore so long as you do turn up within the 15/20 minutes prior to a show you are guaranteed a reasonable seat? Is this your experience or at least what you might suggest to be the case? I am just concerned as the reserved seating itinerary does not leave that much time between each show if you need to be queing for longer than the recommended time on the tickets! With the reserved seating, 15 minutes should be just fine. I am interested in taking my 1 yr old on Christmas Day. Would I be able to spend the entire day there, then head back to the hotel so he can take a nap, and then return for the Christmas experience at night? This is a very busy day, and while it's possible, do keep in mind that you will need additional time for coming and going with all of the extra people in the park. There is also a chance it could be at capacity for some part of the day. 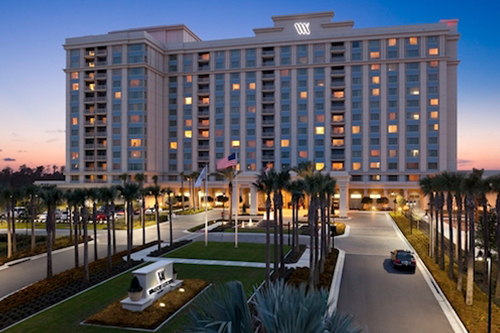 If you decide to do this, we'd make sure you are at nearby hotel and upgrade your parking (if you have a car). Any information for 2016 yet?! We are coming the week of November 7th and I was curious if most of the above would be available then! Thanks in advance! We don't yet know this year's dates, but typically it doesn't start until later November/early December. Is the Polar Express Experience only open on the weekends in December? We are planning to be there December 21 (Monday). It's open every day during the holidays. I planning to go on dec. 25 can I get any tips what time. To see more thing on that day. Is it very crowdy.? We have updated this post with more details about this year's event. Check it out. You can see the schedule here. The park is open from 9 a.m. to 9 p.m. that night, and I would definitely stay through the evening to experience the snow flurries, Antarctica Christmas tree and Winter Wonderland on Ice. If you plan to visit the Polar Express, I would recommend doing it early in the day. Hello. I plan to come on Dec 31st 2015 with my 3 little (6 years, 3 y and only 6 month). I assume it will be more than crowded this day. Do you confirm I shall buy the reserved seatings to avoid long lines with the small kids everything but patient... Is the reserved seating usable for all the shows during the day, or only one ? And are they already on sale ? I was not able to ad this to the cart on seaworld website... Thanks ! Details have not been released yet on how reserved seating will work this year, but I would recommend it for Dec. 31. Are the Sesame Street characters available for meet and greet or do they just perform in the show? At this time, we don't know yet whether they will be available for meet-and-greet. Hopefully, we'll get more information as the event gets closer. I am planning to visit sea world Orlando on December 7, which is a Monday, and I wonder how bad is the line up to the Christmas shows? I have a 2.5 year old and an 1 year old. Do you think it worth paying extra for the Christmas show seating tickets? I don't think you will have any issues with lines at this time, but keep in mind that SeaWorld's Christmas Celebration is typically held on select nights and may not be available on that Monday.